After our recent trip in the South West and leaving Frome we had some time to kill and headed back to Bath as that was where the coach would be departing from. There are many places to go to in Bath to walk around and admire but my back was still in agony from the day before.so I kept needing to sit down and take a break. Plus I was getting grumpy with hunger. So my partner looked up the Wetherspoon’s in Bath and we found out it was The King Of Wessex in a building of various restaurants and an Odeon. It was hidden behind builders scaffolding when we arrived but inside was perfectly functionable and appeared as normal. It was actually a very long room and expanded a massive distance back but with the bar, toilets and kitchen it was not very wide. Tables were placed in a difficult position that meant you had to weave in and out to work your way down the room. But I wanted cheap. And I mean cheap by ‘Spoons standards. We agreed to have the two for deal in an attempt to save money. With still feeling sad, from the family event I had to attend, that also gave me the chance to have cheesy carby goodness in a nice simplistic warm meal manner. 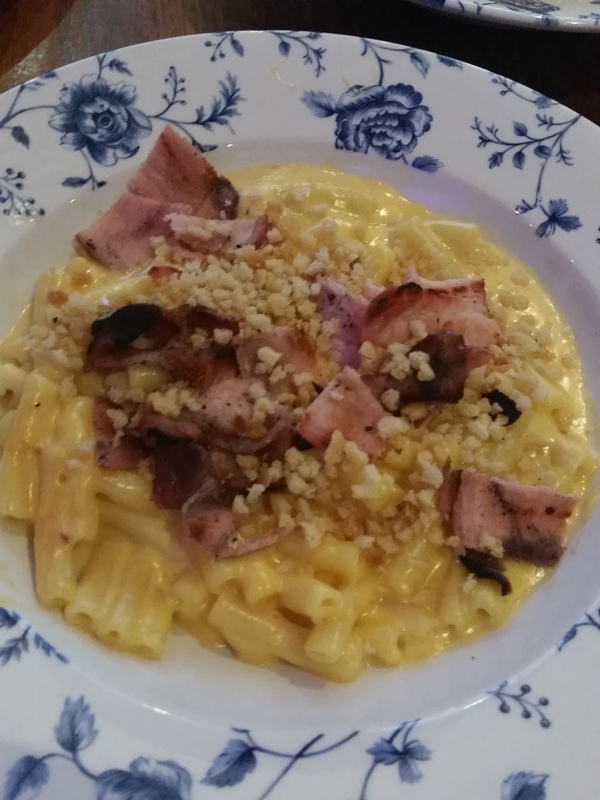 Ordering mac and cheese in a Wetherspoons seems like an incredibly risky. I have never actually spotted it on one of their menus before and had never heard anybody mention it so I had no idea whether it was going to be tasty or not. 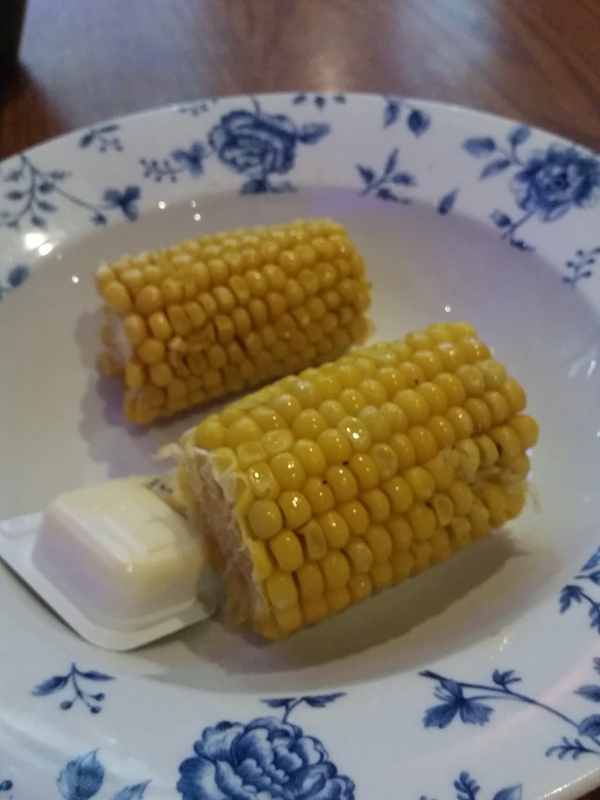 Just in case I got a side of corn on the cob to ensure some tastiness and also a little bit of vegetable. Wetherspoons normally manage bacon perfectly fine but here the added bacon was almost burnt. It takes quite an extrodinary amount to frazzle bacon so in some ways I want to applaud the chef for managing it. I was not expecting the crispy and crunchy little breadcrumbs to be scattered on top of the mac and cheese either. Initially I thought it looked like really weirdly crumbled cheese but it was not. The pasta was pretty much perfectly cooked and that was certainly a welcome relief. There is nothing worse than seriously overcooked and collapsing pasta. It was obviously coated and surrounded by a cheese sauce but it really lacked any noticable cheese and I know I complain about the level of cheese often but I could not taste ANY. When you are a massive cheese obsessive like me that is a massive let down. It was tasty and I certainly wolfed it down but I have encountered better ones in the past and apart from my worst attempt I feel I have generally done better myself. The corn tasted okay, not like it was really fresh but there was certainly nothing wrong with it. They were well cooked but each bite still had that little pop in the mouth with it. In the end I could only manage one and gave my partner the other one partly from being full but also partly because I felt like people were looking at me as I was eating it. I probably would not order mac and cheese again, especially paying for added bacon, but I might be tempted by the corn on the cob. It was a decent enough Wetherspoons and I would be okay with going there again if I found myself in Bath and would not urge others visiting to stay away but the shape of the room certainly felt a little strange and it made me feel awkward walking my way through it. This entry was posted in Food and Drink, Restaurant Reviews and tagged american food, bath, cheap, eating, fdblog, fdblogger, fdbloggers, food, Food and Drink, food blog, food blogger, food bloggers, food review, holiday, mac and cheese, restaurant, Restaurant review, south west, trip, wetherspoons. Bookmark the permalink.